Amla hair oil has been an integral part of hair care rituals in the Indian culture. It has played a key role in nurturing and fulfilling dreams of thick and beautiful hair which every woman takes pride in. This wonderful hair oil acts as a natural conditioner, minimizes hair loss and greying, and encourages strong and healthy hair growth. Why Make Amla Hair Oil At Home? Simply because you know what goes into it. Market bought amla oil can contain many undesirable ingredients such as mineral oil, refined oil, artificial colour, and preservatives, which do more harm than good. Whereas when you make amla oil yourself, you can be assured of its purity. I am going to show you 4 different methods to make amla oil. You can try out all the four and decide which one you like (your hair likes) the most, or you can simply pick one that you think is doable. Whatever method you choose, make the process enjoyable as you also transfer your pranic energy (vital energy) during the process. This is the most effective of all the methods. I promise you that your hair will look shiner and healthier after applying this oil. You got to try this at least once. It’s very simple and easy to make fresh amla oil. First step is to grate/blend the amla and extract its juice (discard the pits). 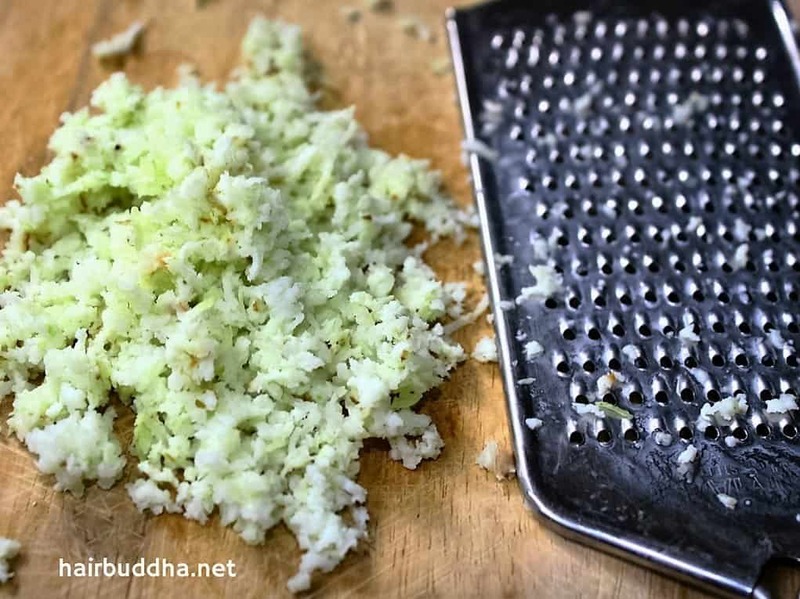 I use a grater and then simply squeeze out the juice with a sieve or hand. Next, combine coconut oil with amla juice and beat the mixture with a fork or spoon so that it combines well. And your fresh amla oil is ready. Slightly warm the mixture (by placing in hot water) till coconut oil melts completely. Massage on your scalp and hair and leave it on for 1-2 hours, then wash off. Grate the amla and discard the pit. If you like you can use a blender. Squeeze out the amla juice. Add coconut oil to it and whip it together for 4 to 5 minutes. Place the whipped oil in hot water until it goes liquid. Your freshly made amla oil is ready. Tip: If you don’t get fresh amla, you can use frozen ones, they work equally well. You can buy fresh or frozen amla from Indian store and when in season (October to March) freeze them for later use. And if you don’t find fresh or frozen amla, you can buy amla juice. *You can use olive oil, sesame oil or mustard oil instead to coconut oil. In this method you heat the amla and coconut oil together on a low flame so as to extract the vitamins and phytonutrients from the amla. I prefer to use dried whole amla for this, as it easier to handle compared to the powdered amla, which can get burnt on direct heat. Combine amla and coconut oil in a stainless-steel pan. Place the pan on the lowest heat setting and keep stirring occasionally. After 8-10 minutes it will start emitting a nice aroma. You will also see bubbles around the amla, cook for couple of more minutes, then turn off the heat, cover the pan and allow to steep for 24 hours. Next strain and pour the oil in a glass jar. It’s ready to use. Note: If coconut oil solidifies, lightly heat again then strain into a glass jar. I prefer to use glass jars for herbal oils as glass doesn’t react with the herbs and keeps the oil fresh. You can also use the double boiler method to make amla oil. 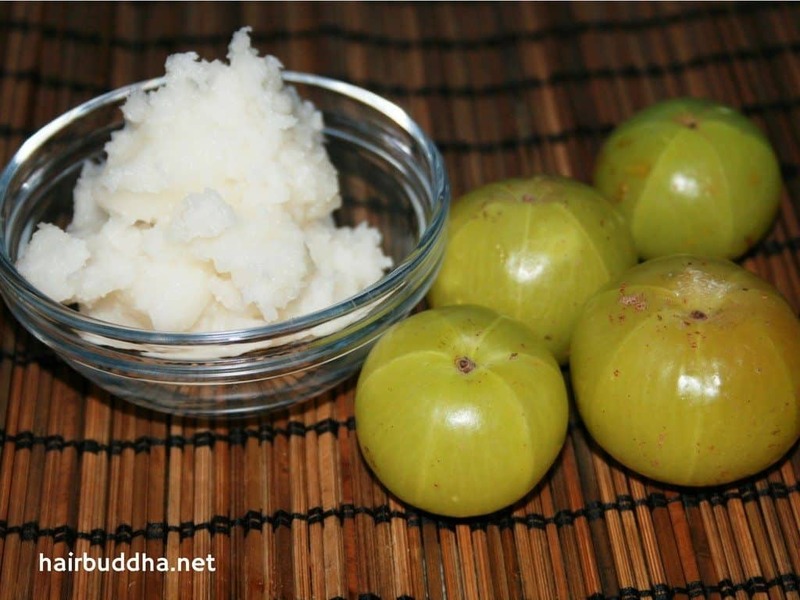 For this method you can use either amla powder or amla whole. Amla powder will give a dark coloured oil, whereas whole dried amla will only slightly change the colour of your oil. Allow the oil to cool enough to be handled and then strain into a glass jar. 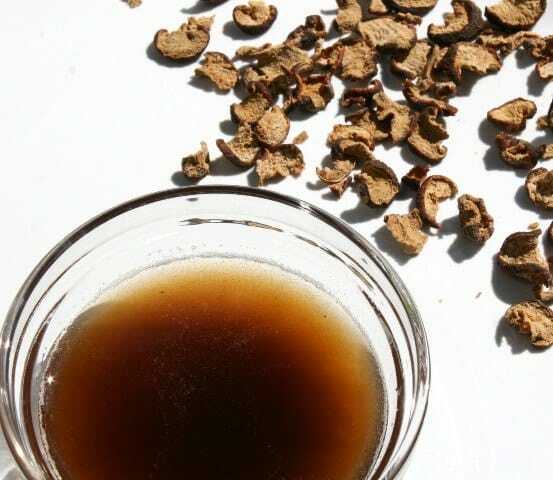 You can store this oil in a cool, dark place for up to a year. This is the simplest way to extract amla properties, but it takes about 4-5 weeks to be ready. Combine amla powder and oil in a glass jar or glass bottle. Place the jar in sunny location and steep for 4 to 5 weeks. The sunlight will encourage amla to release its vitamins and nutrients into the oil. Gently shake or turn the jar 2 or 3 times a week. This is a traditional ayurvedic approach to making amla oil. It’s slightly tricky and time-consuming and takes about 2 to 3 hours to prepare. Combine 100 gram amla powder with 1 liter water in a pan. Bring to boil, reduce the flame, and simmer until approximately half of the liquid has evaporated. Then strain this amla concentrate. Next, take a thick bottom stainless-steel pan, place the coconut oil, remaining amla powder (20gram), and the amla concentrate that you made (approx. 500ml). Bring to boil, then reduce the flame and let this mixture simmer very slowly until all the water has evaporate. When it’s done the oil will appear yellow and transparent and you will be able to see the dark bottom, which is caused due to amla ash. Once done, strain immediately and store in a glass jar or bottle away from direct sunlight. Along with amla you can also add various hair beneficial herbs such as brahmi for strengthening, bhringraj for greying, methi (fenugreek) and hibiscus for conditioning, rosemary and sage for hair loss, lavender and chamomile for scalp conditions, and calendula for shine. Note: When adding any herb, keep the oil to herb ratio roughly the same. So you will have to reduce the quantity of amla powder and add herbs of your choice or increase the oil content. Coconut oil and sesame oil have been traditionally used in the preparation of amla oil and both are equally beneficial. Coconut oil is cooling by nature and is more beneficial if you have premature greying or suffering from hair loss. While sesame oil is by nature heating and should be used if you have tendency to catch cold easily or if you are suffering from sinus. Sesame oil is also beneficial for those with dry hair. You can also use other hair nourishing oils such as olive, sunflower, avocado oil if you like. It’s always better to begin with small amounts, if something goes wrong you will waste less (I don’t feel good about wasting stuff). Once you have made couple of times, then increase the quantity. Take 1 to 2 tablespoon of amla oil in a bowl. If you wish you can warm the oil by placing the bowl in hot water for couple of minutes, but it’s not necessary. Apply to your scalp and massage gently using your finger pads. Run fingers through hair to saturate the strands. How long you should leave on will depend on how much time you have, but I would suggest at least one hour, and if possible leave it overnight. Make this practice a form of meditation. Just focus on the nourishing process and imagine your hair getting healthier, stronger and shiner. Then shampoo as usual. You shouldn’t need a conditioner (try skipping it once to see if it works or not). You hair will feel healthy and soft, with added shine and volume. I hope you enjoy making this nourishing oil. Have you made amla oil at home? How did it turn out? Share below! Can i add curry leaves and kalonji powder also in it? Because I have premature grey hair. And if I can add, then what will be ith quantity?? Coconut oil does not suit my hair – it makes it dry and brittle. I am planning to use coconut milk instead. 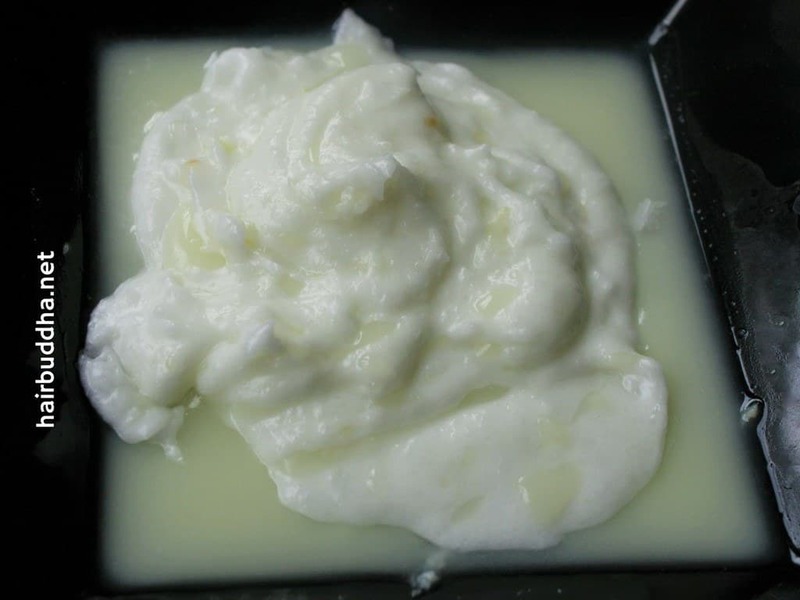 Is fresh alma juice/oil still powerful when mixed with coconut milk? Yes, go ahead and mix them. Do they need to be heated together first? Yes it’s fine. You used dried or fresh amla? I have prepared oil using fresh Amla and the moisture is left I think as I didn’t boil it long. What can I do to remove the excess water content as I don’t want to waste it. Hi…thanks for showing all the methods of making amla oil.I tried to make amla oil with fresh amla.It turned out to be great.Now I want to make oil with amla powder and store it for a year so that I can use amla oil even during offseasons. 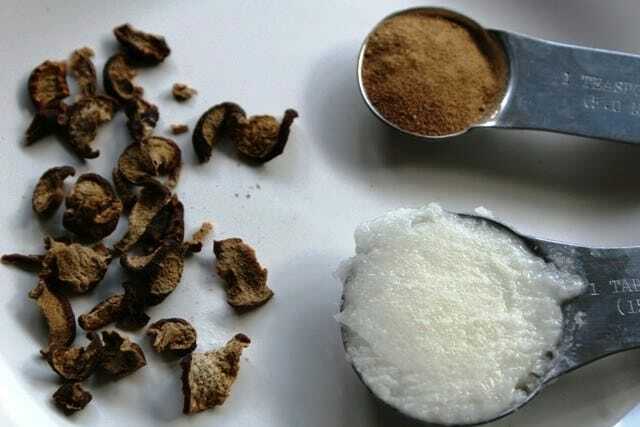 Can i sun dry fresh amla pieces and grind into powder?Shall I use this powder with oil and store it…or is it better to use the powder with oil in small quantities whenever I want to apply? Hi Amrita, you can dry the amla and make powder. You can also make oil with dried pieces. Try both methods. And write down the exact recipe as it may turn out great and you would have forgotten the measures. Hi Minaz. Thanks for the reply. I will definitely try both the methods. I have started using amla oil twice a week.My hair is now shiny , black and softer.Hair fall has reduced to a great extent.But I have lost a lot of hair on the crown and hair partition has broadened a lot n scalp visible too. Can u plz suggest some simple hair growth solutions. I dont have any dandruff problem and my hair texture is baby fine. After washing your hair, use this as last rinse. Add fenugreek seeds to it. Massage into your scalp for couple of minutes. You will definitely see hair regrowth in few months. Let me know how it goes. Ma’am can u plz tell me abt the preparation of bottlegourd oil (dudhi oil) i heard abt it but I really wanna know abt it before using it. You can find all your answers here. Hi can I make the oil. N store it at 1nc.the 1 made from fresh amla or do I have to make it fresh everyday. Hi Nikita, you can’t store the oil made with fresh amla as it will go bad. So make fresh every time. I would like to use the traditional method, using dried amla, brahmi, bhringraj, and hibiscus. What measurements should I use, with the additional herbs? Thanks Minaz, you have been a great help in providing such wonderful information. Did you read the post? This article is about how you can MAKE your own oil AT HOME. You buy the ingredients and follow the recipe. If you want Amla Oil that is already made, you go to a store and buy it. It will stay good for 3-6 months. Can i make sesame oil by using mustard oil instead? Is it beneficial? Can we use patanjali Amla Powder and Coconut oil? Thanks mam if I want to make amla in a big quantity with amla powder can I use paraffin liquid oil . No, use any plant oil. 1)By First method i.e “Freshly Made Amla Oil” for how long(how many days) we can store this oil? 2) In the Double boiler Method can I use fresh amla juice ? and what will be the colour of the oil on using fresh amla juice instead of amla powder in double boiler method? And at last, is that true we can store this oil in a cool, dark place for up to a year? 1. You have to use it fresh. 2. Don’t use double boiler. If you want to make oil with fresh amla juice, heat the oil and juice together in a heavy bottom pan, make sure it’s on the lowest flame, and continue heating till all the moisture is gone and you have transparent oil. Here I have put a link to video on making fresh amla and curry leaves oil. Can Parachut coconut oil be used. I mean is it natural — or like other market oils? If you can find extra virgin coconut oil that is better. I love your shampoo mix with amla in but we have a white metal bath which has non slip white dots and it turns them brown. The stain then stays on until I use bleech very quickly but having read that this will remove the enamel I have had to stop using. I have found it very hard to replace amla because it makes it easy for me to comb my hair, makes it nice and shiney, bouncy and curly. Marshmellow root is the next best but I dont like the smell and its very flat due to hair loss from medication. I have found I can use amla as a hair pack when I have a bath and it seems Ok I am wondering if oil will colour our non slip pads ? Also I have long hair which is thined in the length but thick at about a years growth is the only method to get it onto the roots puting on alot ? 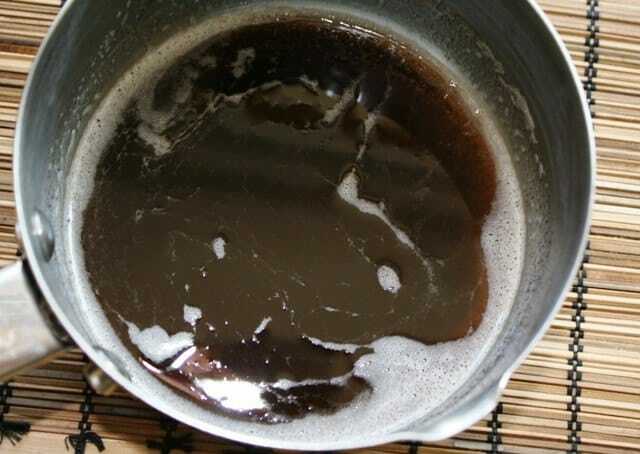 I have tried a bowl of water with a small amount of oil and putting my head in before I dont seem to get oily patches but I am not sure it gets to the roots. I really dont spend enough time to leave it on then wash it again and its winter bbbrrrrrrr. Yes its difficult to find amla substitute. Tip: you can also spray white vinegar to avoid staining. Hi, use amla oil once or twice a week. Do a weekly castor oil and egg mask. hi mam , my hair is become very thin ,breaking just above the root and not growing again. right now i m using Freshly Made Amla Oil in night since 15 days please help me to regrow my hair. I imagine you could use a pressure cooker to speed up the process, while using just a small amount of water as a substitute, when using the traditional method. Pressure cooker will not help in anyway, don’t use. You can use slow cooker. How about henna? Is it beneficial in an oil infusion? Yes it is. Try adding 1/2 to 1 teaspoon. Can i use mustard oil instead of coconut oil? What is the purpose of making amla oil – hair loss, growth or conditioning? Hello sir,I had hair loss problem so I used …. Hair oil later. It changes. To brown colour. Now I have. Over hair loss.pls suggest me solution for dense hair and changing hair from brown to black. Can I subsititute the coconut oil with something else because I like using cocount oil by itself and I don’t want to waste in case something goes wrong (and it is expensive to buy). Can I use rice water instead? Naz, You can add amla powder to rice water for a hair rinse. If you want to make amla oil, you can substitute coconut oil for almond, olive, or sesame oil. Also, make things in very small quantities to see how your hair react to them. Hi Minaz, can I make it with fresh raw amla?? Hi Bebo, yes you can use fresh amla for method 2 (heat infusion) & 3 (traditional way). But make sure there is no moisture left, unless using fresh. For sun infusion you will need dried amla powder or pieces, as fresh amla will go bad in few days. You can also dry amla at home: Cut fresh amla into small pieces and let them dry under the sun for 3 to 4 days or until dry and crisp. Use this to make the Amla oil. But what if I take out fresh amla juice and then boil it with coconut oil and store it.???? Will it be harmful? Bebo, yes you can make amla oil using fresh amla juice, just make sure you cook up all the juice and no moisture remains. Can i make amla oil by using mustard oil instead? Is it beneficial? Have you tried boiling amla juice with coconut oil? Please tell me its full procedure.